A look at how trendsetting operators are successfully launching mobile TV services. Traditional television has had a glorious run. For decades, broadcasters and content providers have extracted profit from this media conduit to the mass market by offering a growing array of channels and scheduled programming on ever-bigger screens. However, this paradigm is now being challenged by the Internet, ever-growing data rates on both wireline and wireless networks, as well as the proliferation of content formats and devices. End users, meanwhile, have become more demanding and fragmented, splitting their precious time among myriad media choices, channels and platforms while younger viewers move beyond the TV content consumed by their parents’ generation. As a result, traditional TV is experiencing significant erosion of viewers and advertising revenues. According to ABI Research, the number of mobile TV subscribers worldwide will grow from 11 million in 2006 to 462 million in 2012, representing a Compound Annual Growth Rate (CAGR) of 85%. But cashing in on this growth will require service providers to make significant changes to existing network infrastructures and business models. The migration away from analog TV will free spectrum to enable service providers to build dedicated broadcast networks. The acceleration of mobile broadcast networks (such as DVB-H and MediaFlo), the 4G network adoption (LTE/WiMAX (News - Alert)) and the proliferation of user-friendly handsets and other portable multimedia devices will increase the advantage gained by the early movers in this space. Differentiation from voice-centric plans is just the beginning of the journey. Service providers are at a pivotal point to leverage the merging broadcast and telecom worlds. This fusion will empower new levels of converged and blended services, for example seamless multi-screen experience and interactive targeted advertisements, allowing users to have anytime/anywhere access to the content they crave, while enabling service providers to implement innovative business models and tap into new revenue streams. A close look at some of the trendsetters in mobile TV services should provide inspiration and encouragement to service providers considering moving into this space. Australia’s Telstra is in the midst of an initiative that will transform this national leader in traditional telecommunications services into an integrated media communications company. The service provider is focusing on the end-user experience and maximizing operations through an IP-based infrastructure capable of running advanced multimedia applications. • Alcatel-Lucent 5910 MiTV solution enables a highly personalized, interactive service with advanced features, including fast channel change, user interactivity and a compact client for embedded applications on handsets. • Project deployment and integration. • Interoperability test centers to ensure ongoing service uptake with a wide variety of terminals. Telstra launched its interactive mobile TV service in 2007, to leapfrog competition from existing mobile TV-over-Wireless Application Protocol (WAP) providers and to maximize its 850 MHz spectrum High-Speed Downlink Packet Access (HSDPA) network to monetize content. To effectively go to market, Telstra has extended the branding of its preexisting Foxtel IPTV (News - Alert) service. • Diversified and compelling content: Telstra mobile TV delivers a diversified and rich array of choices — from short TV formats to full-length movies and video on demand – more than 33 live channels with 24 made-for-mobile channels. • Flexible package/offering: Depending on appetites and budgets, subscribers can sign up for a channel package, a monthly subscription or just a day pass. Content ranges from general entertainment, to music, news, documentaries, kids programming and sports. • Whenever and wherever: Customers can use their next-G mobile phones to remotely program their Foxtel IQ set-top box to record their favorite programs. Telstra is the first in the market to offer a “catch up TV” service (Figure 1). • Premium end-user experience: Telstra offers a premium experience with high-quality delivery and fast channel change. The high quality visual experience is maintained during program selection using the embedded Electronic Service Guide (ESG) and Electronic Programming Guide (EPG). • Interactive TV: Telstra mobile TV has partnered with major TV producers in Australia to deliver exclusive live access to popular programs. End users can respond to contextual teasers embedded in programs, allowing them to directly interact with program- and content-related activities. For instance, the “Australian Idol 2007” series included a simulcast of the show across six states, and Telstra was able to offer location-enabled time delays for five time zones. As a result, Telstra’s mobile TV is the most comprehensive mobile entertainment service in Australia. According to Telstra, its mobile customers have watched more than 80,000 hours of mobile TV during the month of April 2008 alone. 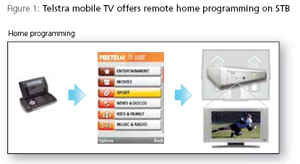 Mobile TV has effectively helped Telstra to monetize its wireless network and contents. • Hosts and manages a mobile interactive TV solution on behalf of Optimus. • The Alcatel-Lucent 5910MiTV and rich media client enable outstanding performance and first-to-market performance features in Portugal. • Provides excellent ongoing support: executing a significant capacity and enhanced feature upgrade with only four weeks lead time. As Portugal’s third-largest mobile carrier, Optimus is embracing advanced applications to differentiate its services from incumbent providers to both stimulate subscriber growth and maintain its image as an innovator in the competitive Portuguese mobile market. Optimus first launched its mobile TV service in August 2006. It targeted young people and business segments, offering exclusive content (such as music and sports). To maintain its leading-edge “innovator” image, Optimus has regularly enhanced its service by working with Alcatel-Lucent to offer subscribers new, intuitive experiences. In August 2007, Optimus launched a high-definition mobile TV service that used encoding algorithms and technology developed by Alcatel-Lucent, doubling the screen resolutions that were previously available in the Portuguese market. By October 2007, the company was among the first service providers in Europe offering the ability to navigate between programs while continuing to view the current channel with high quality. In June 2008, Optimus successfully associated its mobile TV service with the UEFA Euro 2008 soccer championship. It rolled out a service called “Euro per 1 Euro” that allowed subscribers to receive transmissions of live matches in either a high-definition format (250kbit/s) or a regular format (115kbit/s) for the price of one Euro. Users also could receive automatic SMS alerts of UEFA-published videos, including near-real-time event-based videos of key plays, goals, penalties, game highlights and player profiles. As of early June 2008, “Euro per 1 Euro” had more than 12,000 subscribers following an aggressive radio and TV marketing push by Optimus. Also this year, Optimus worked with Alcatel-Lucent to deliver a portable mobile TV encoder capability, enabling Optimus to offer live coverage of local concerts. The carrier has already covered 10 concerts for its mobile TV subscriber audience. Solution adviser – Alcatel-Lucent Unlimited Mobile TV solution based on DVB-SH. ICO will need only 1500-2000 sites to cover the “satellite white spaces” in the urban/suburban areas: the right choice for maximizing spectrum efficiency. E2E Solution architect – Developed the solution architecture and detailed network design, including the Alcatel-Lucent 5910 MiTV and the Alcatel-Lucent 9600 DTR Transmitters (DVB-SH terrestrial receivers). Prime integrator – Ensure time-line in project execution and make it work by orchestrating multivendor (such as chipset, broadcast head-end partner), multi-technologies. ICO Global Communications is a satellite communications company based in Reston, Virginia, USA, that has developed an advanced hybrid system combining satellite and terrestrial communication capabilities. In doing so, ICO is able to offer wireless voice, data, video, TV and Internet services on both vehicular and portable devices. In April 2008, ICO successfully launched the ICO-G1, a next-generation geosynchronous satellite operating in the 2GHz S-band with a service footprint that covers most of North America, using the Digital Video Broadcast - Satellite services to Handhelds (DVB-SH) standard. The featured service, ICO mim – mobile interactive media – will deliver entertainment, guidance and assistance through a platform that is both integrated with multiple networks and accessible on various devices. • Entertainment: ICO mim will deliver 10 to 15 channels of premium live TV content for 7- to 15-inch screens – setting the standard for the ultimate mobile video entertainment experience. • Guidance: ICO mim will provide a new level of intelligent, interactive navigation. ICO mim combines the experience consumers enjoy with today’s navigation systems (such as real-time traffic and weather alerts, rerouting and easy access to destination information) with ICO mim’s unique integrated applications which allows users to preprogram tasks and activities into their system. ICO mim gets users from Point A to Point B (News - Alert) and lets them connect anywhere they may need to go in between. • Assistance: ICO mim offers a complete roadside assistance and emergency messaging capability, with satellite-connected emergency voice and text messaging assistance, bringing peace of mind wherever their customers go, including the places where today’s vehicle assistance systems and cellular networks don’t reach. Starting in late summer 2008, the ICO mim service based on DVB-SH is being tested during an alpha trial, integrated end-to-end by Alcatel-Lucent, in Raleigh-Durham, North Carolina, and Las Vegas, Nevada (Figure 2). Leveraging strategic partners, ICO’s go-to-market plan will offer ICO mim as an embedded service behind existing video displays: for example, current in-vehicle screens and other devices such as portable gaming systems, DVD players, laptops and mobile PCs. Over time, the goal is for ICO mim to be embedded into a wide range of consumer electronics devices. Mobile TV is a global opportunity. In addition to Australia, Portugal and the United States, mobile TV is being well received in countries such as Japan, Korea and Italy. While challenges remain for carriers looking to launch mobile TV, trendsetters are already demonstrating the business models – such as combining free-to-air with paid subscriptions – that make this opportunity viable and profitable. Mobile TV will be an important part of the end user’s anywhere, anytime viewing experience as technology continues to migrate toward a truly seamless multi-screen ideal. 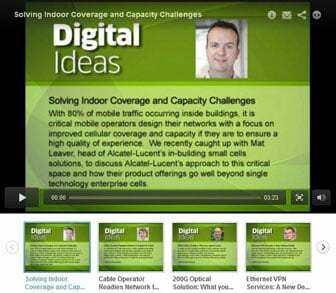 Alcatel-Lucent offers an array of solution options and support to help operators speed new services to market. The bearer-agnostic Alcatel-Lucent 5910 Mobile Interactive TV solution, with its compact “rich media client” is gaining traction in the delivery of personalized, interactive TV to a broad range of mobile/portable players. Following on the success with ICO and its proven flexibility in topology and spectrum efficiency, the Alcatel-Lucent Unlimited Mobile TV solution, based on DVB-SH, has been trialed by many operators such as Vodafone SFR (News - Alert). It is now in trial with Dish Network in the United States. To help mitigate risk, Alcatel-Lucent offers a hosted and managed mobile TV service model as well as a stepped service-launch approach. This empowers operators to maximize nimbleness, while minimizing infrastructure investment, enabling them to focus on customer acquisition and subscriber sales versus building networks and updating technologies. Alcatel-Lucent also offers its expertise as a veteran network integrator to help manage the complexity of each network implementation phase in multivendor/multi-technology environments — assuring smooth and robust mobile TV service rollouts. As a fully committed solution partner offering a wide range of resources and expertise — regardless of the starting point of the journey toward mobile TV (for example unicast, broadcast) — Alcatel-Lucent is positioned to help service providers deliver truly seamless entertainment and communications experiences to their end users as well as effectively tap into new revenue streams. Olivia-Yongmei Ding is Marketing Director, Carrier Business Group, Market Positioning, Alcatel-Lucent, Vélizy, France. Bob Long is Marketing Manager, Multimedia and Ventures Product Group, Marketing, Alcatel-Lucent, Phoenix, Arizona, USA. Eric Giaretto is Communications Director, Alcatel-Lucent Mobile Broadcast, Marketing and Sales, Alcatel-Lucent, Vélizy, France. Yacine Mahfoufi is Multimedia Strategic Marketing Manager, Alcatel-Lucent, Villarceaux, France. Click to the Enriching Communications article page to access the pdf download, any related materials, contact the authors and/or request any additional information.